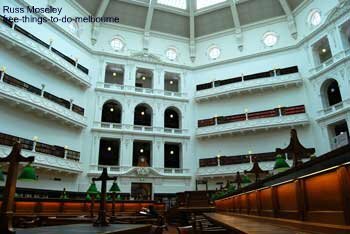 Spend your afternoon in a comfy chair in the State Library of Victoria reading your way through one of those great books that are on your 'must read one day' list. .......You'll find stained glass windows, fantastic murals, marble staircases and really attractive rooms. .......We did get to see a room which is normally closed off to the public though. 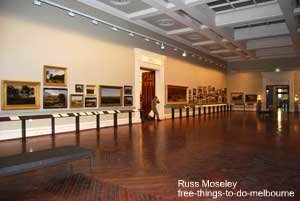 There's also a number of galleries providing both permanent and changing exhibitions including the Keith Murdoch Gallery and the Cowen Gallery. Free tours are available for some of these galleries too. 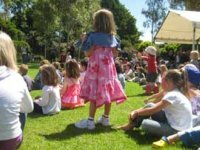 ......Click on State Library to find out up-to-date activities, exhibitions etc or you can call (03) 8664 7099. 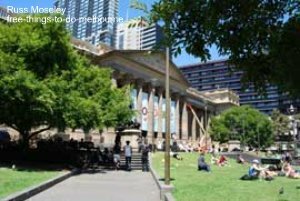 The Library's located at 328 Swanston Street, right opposite Melbourne Central. Opening hours are Mon-Thur 10am-9pm and Fri-Sun 10am - 6pm.